Well…the cat’s out of the bag. I’m also a proud new owner of an ASI1600MM-Cool. We are starting to see a number of cameras and images out in the wild now. Rather than piggyback on the other main "beta test" thread (which is quickly approaching 1000 posts and getting nearly impossible to navigate if you haven’t kept current), I decided on a new thread to walk through my experience so far with the camera and share my first light. That other thread is a wealth of information and invaluable to owners of the camera so I’ll link to it here. But, there are pages upon pages to wade through and some seriously in-depth analysis. 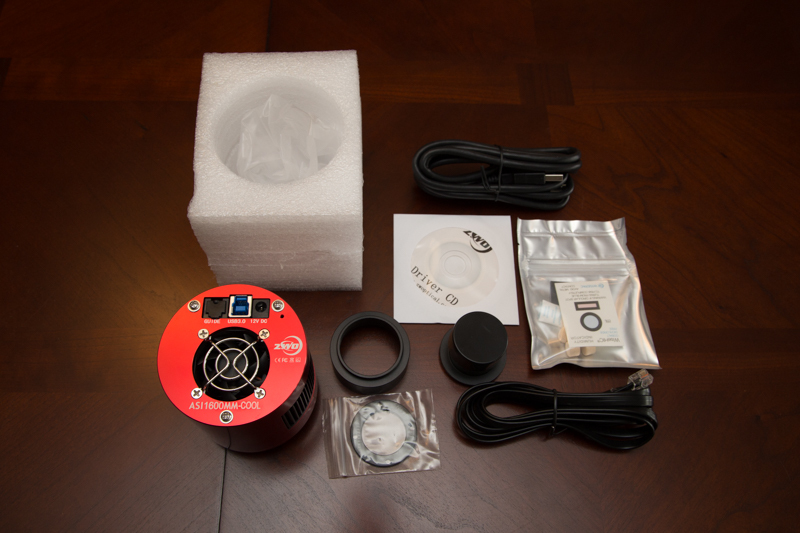 I’m going to try to approach this review from a Beginner or Intermediate Imager standpoint. Due to the price point, this is a very attractive option for someone stepping up from a DSLR or a low end CCD camera. I feel it’s important to have a simple walk through. I got a number of positive responses from my previous ASI174MM-Cool review, so am continuing in that spirit. I think there is general agreement that, on paper, this camera has the performance to run very competitively with the entry-level CCD market. As such, it’s likely to land in the hands of some newcomers to the hobby. As many of you know, since November of 2015 I have been imaging with the ASI174MM-Cool and it has been a truly fantastic camera for me. 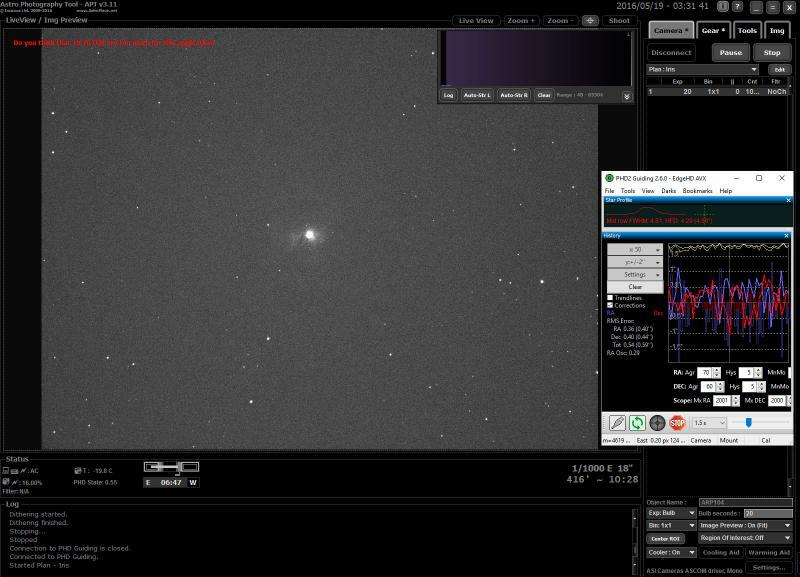 With nearly 80% quantum efficiency (QE) and big pixels it was a great match for my long focal length scope. My review of that camera is here. Many sample images can be found on my Astrobin page here. On to new and exciting things though… enter the ASI1600MM-Cool. I’m sure that there are many folks that already know the specs. 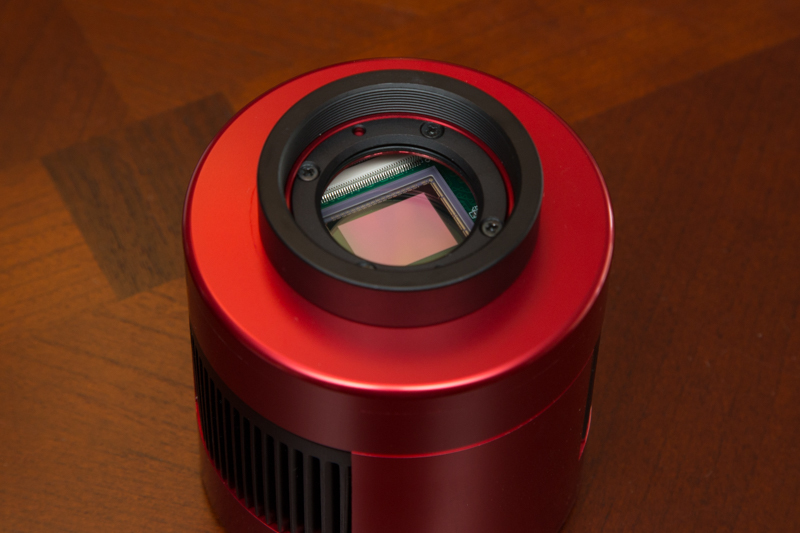 It is a 4/3” format CMOS sensor and available in 4 flavors (one shot color and mono, each version is available standard or with a thermoelectric cooler). A jump over to ZWO’s site can provide the full specification list with details about the camera here. Smaller pixels – Here I am taking a big step down in pixel size from 5.8 microns down to 3.8 microns. That makes the pixel area less than half the size. The generous full well depth on the ASI1600 is more than half the ASI174, though, so there is not much harm here besides a bit more over-sampling. Software binning is an option I could consider also. Quantum Efficiency – This is actually still an unknown because it is not published by the manufacturer and apparently is difficult to test. 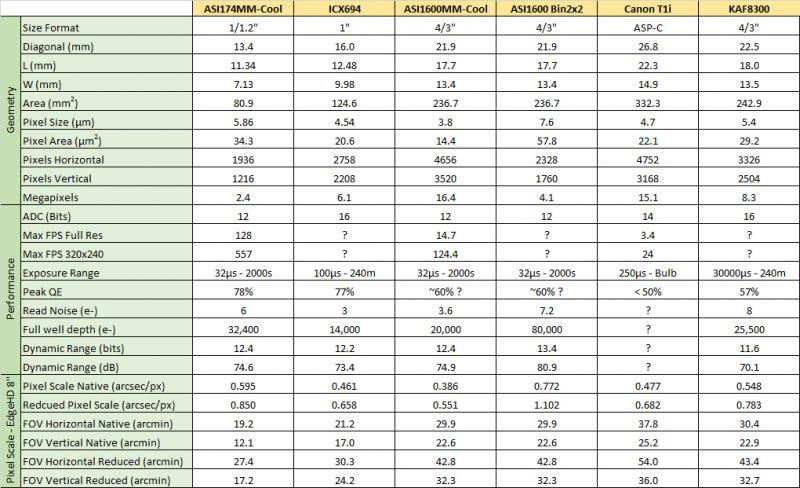 ZWO estimates it at about 60% for the mono camera which would put it competitive with the KAF-8300 chip, but a bit behind the leading edge of the market. This will definitely be one area that I will be giving up on with respect to the ASI174. FOV – This was the big draw for me. As fantastic as the ASI174 has been for me, the field of view is small. The chip in the ASI1600 offers 3 times the imaging area! One other thing worth mentioning that gets a lot of attention is the amp glow. Coming from the ASI174 and a DSLR, I really did not feel this was a major drawback. 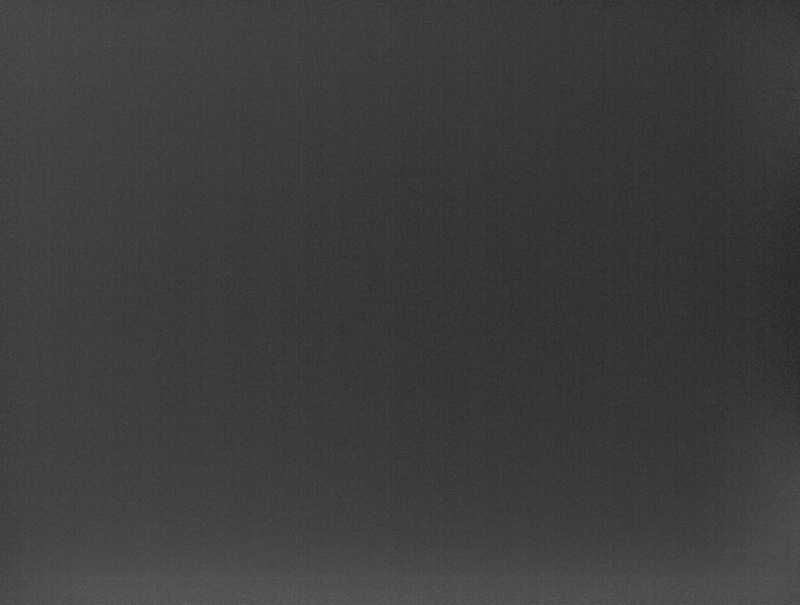 In those other cameras, full calibration was not an issue for me and I do not expect it will be one here. By comparison, the ASI1600 exhibits much less glow in general. But, with all things, we shall see. 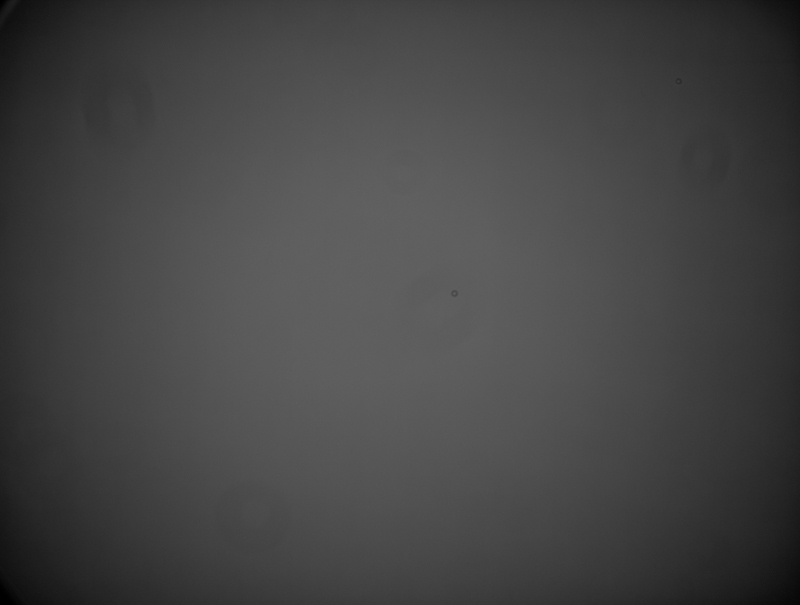 Sometimes CMOS cameras can be susceptible to difficult calibration due to internal recalibrations the sensor performs on itself during subsequent power on/off cycles. I haven’t seen this in my examples, but I’ll be on the lookout. In full disclosure, I’ve been very happy with my ZWO products. They strike an excellent balance of cost and performance and I feel like they are the best value in the market. I try to stay objective, but if I come off biased in any way, this would be the reason. Edited by Thirteen, 22 May 2016 - 10:37 PM. The business end! Love it! For those that don’t like numbers, avert your eyes. But for people interested in how it compares to I put together a little table. I have several more on here that I cropped out for this review, but if you want to see them, just contact me. Much like my ASI174, this camera, on paper is absolutely able to pull double duty as a planetary and deep space imager. I have had good success with ZWO cameras and doing just this. 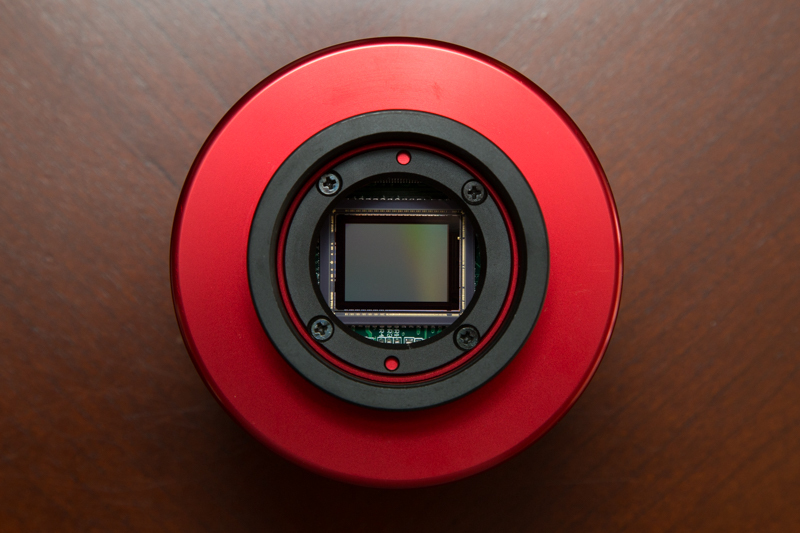 So for anyone on the fence between this and a CCD, you must consider that this camera has that added capability. Edited by Thirteen, 23 May 2016 - 01:41 AM. As concerned as I was with my old ASI174MM-Cool and software compatibility, it turned out to be a complete non-issue with that camera. With the ASI1600MM-Cool, I wasn’t as lucky. I encountered a few bugs along the way. ZWO was quick to respond to my concerns (which I voiced directly to them) and within a day I was sent a revised ASCOM driver to try. Within a week they had publically released an ASCOM driver with a fix. At this point, I can confidently say the issues are resolved in the set of software I typically use. ZWO ships a disk with some software to use with the camera. Of utmost importance, though, and something I’ve repeatedly learned the hard way… make sure you install the latest versions of all software and drivers up front. 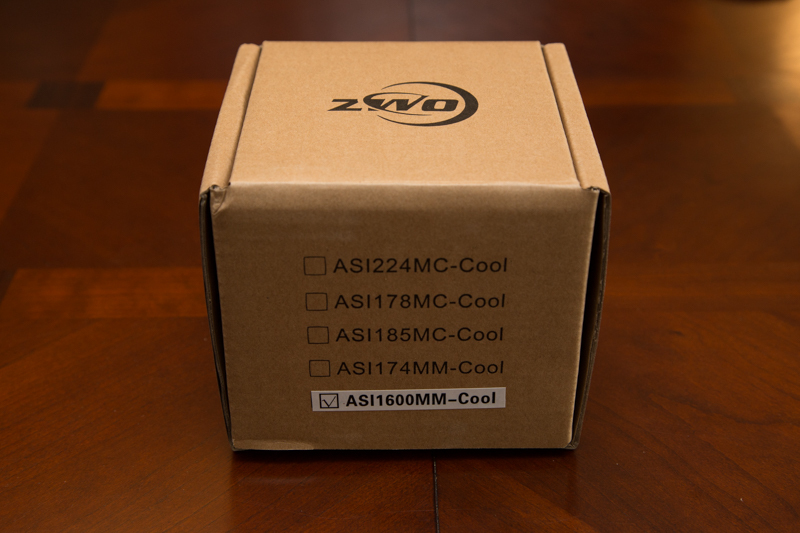 ZWO has been rapidly incrementing drivers to get software compatibility dialed in. Not only that, but software packages that are included are also readily downloadable and constantly being updated. You will need to install both the USB and ASCOM driver to ensure compatibility with most software. The quickest way to get the camera working is to launch AMCap which installs with ZWO’s USB driver. 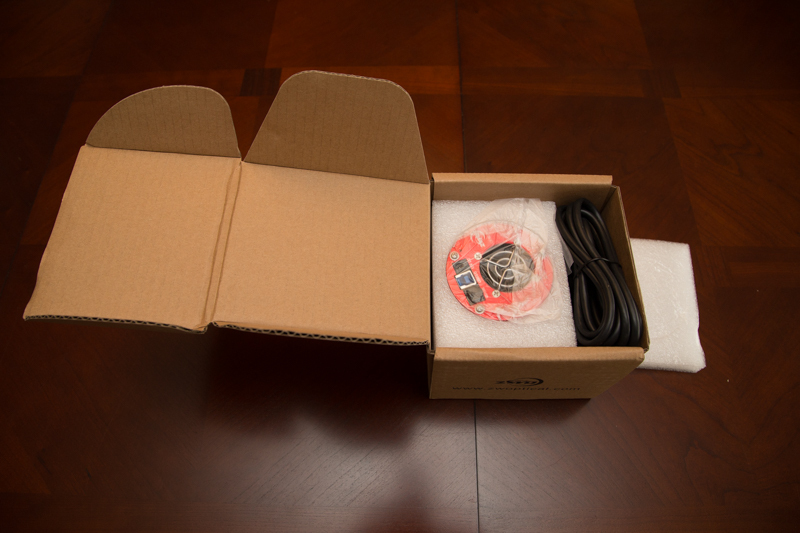 The interesting thing about this box is that it will show you your connection quality. You can see here that I’m connected with USB2.0 and with a blazing framerate of 2.4fps. When you connect with USB3.0, the data rate is such that you can achieve just under 15fps. These values are using the 12-bit ADC. If you switch on the “high speed” 10-bit ADC, you can access even higher framerates. The 10-bit ADC is more than enough for planetary work (lunar, solar, planets) and is recommended for that type of imaging. 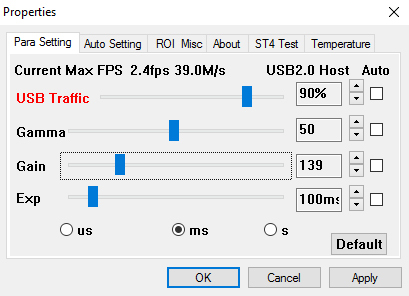 On USB3.0 you can hit 23fps on 10-bit. These framerates are quoted for using the full chip. 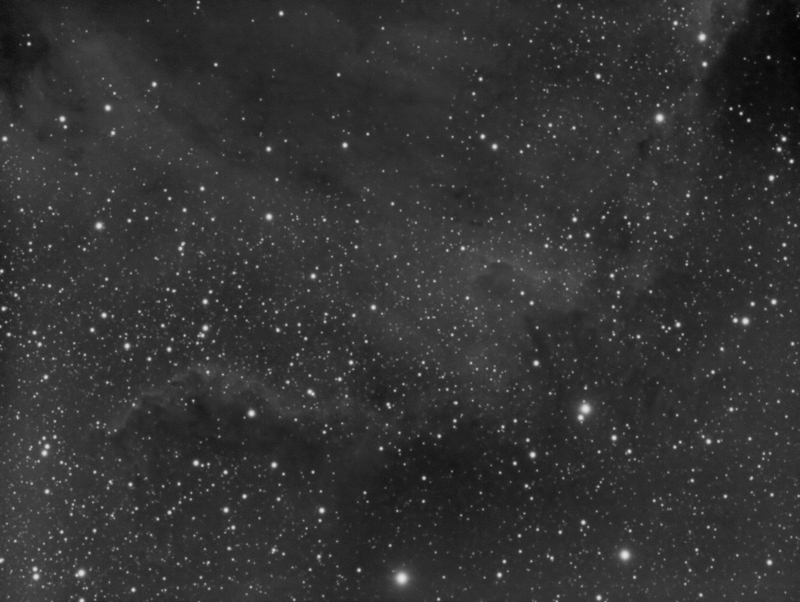 In software applications geared toward planetary imaging, there are region of interest (ROI) capabilities in which you can select a small box of pixels and access framerates into the hundreds of frames-per-second. Edited by Thirteen, 22 May 2016 - 10:51 PM. AMCap also gives you quick access to the temperature regulation on the cooled versions of these cameras. 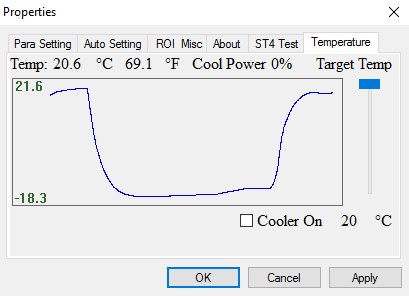 The TEC cooler is true setpoint cooling. The literature for the camera claims 40-45C below ambient is attainable. My testing showed 40C below ambient is possible in a stagnant indoor room. Perhaps outdoors with a breeze 45C is possible, but I haven’t observed (or tried) that yet. 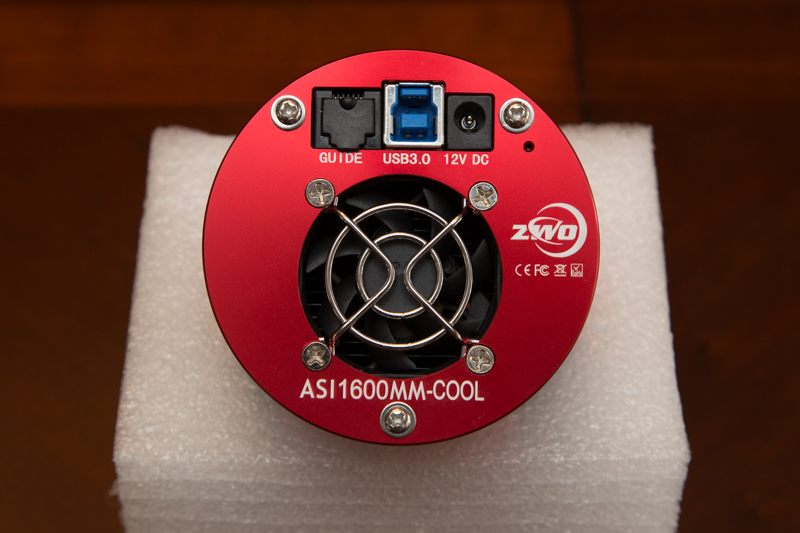 This cooler behaves just the same as my ASI174MM-Cool, which has worked well for me. I imaged at -30C through last winter and have moved that to -20C for the warmer months. I may have to go to -15C at the peak of the summer, but I’ll cross that bridge when I come to it. With setpoint cooling you just want to dial in a reachable temperature and leave it there. 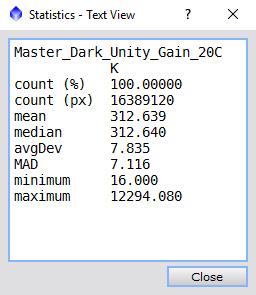 This makes dark frame calibration repeatable. In this image, I set the TEC to cool to -15C. It will maintain the setpoint within 0.1C all day and night as long as it is not below the maximum achievable temperature. In the example below, I did just that. Starting from room temperature of 21.6C, I set the cooler to go to -20C. It got down to -18.3, which is a -39.9C delta with 100% power usage. In a case like this, I would back off to an easily reachable set point like -15C. It will maintain that temperature with about 70% (30% less!) cooling power. The -15C segment flat line can be seen just before I changed the setpoint to 20C and you can see the graph settle up there. The cooling acts fast, taking only a couple minutes to cool to the max. I’m just going to create a pointer back to my ASI174MM-Cool review thread, here, because the ASI1600 camera works the same in AMCap, Firecapture, and Sequence Generator Pro. You can hop over there to look at particulars on how the camera functions. Note: Yes, SGP seemingly works fine now after an initial hiccup. 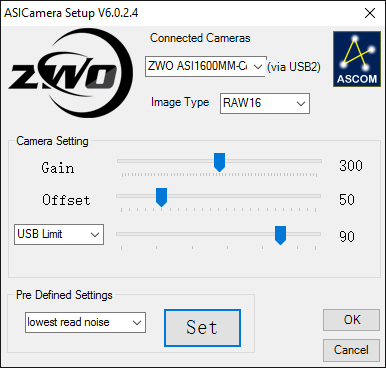 You must use ZWO’s ASCOM driver 1.0.2.5 or later. Software was initially a little difficult just due to the fact that my normal workflow was disrupted (initially without SGP). I had to relearn techniques for framing and focusing. I forgot how much I actually was refocusing during a night until I was forced to do it manually periodically. One other stumble I had was trying to use Firecapture for long exposure work. 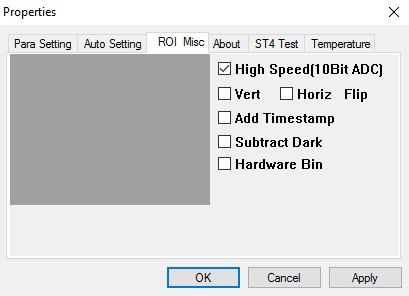 It works fine in 12-bit, but I found when I tried to use 16-bit long exposures, it turned out to be unstable and not provide me with the data I intended. There’s more to this story but I’m not going into detail because it’s off topic and seems unrelated to this camera. Firecapture works fantastically for planetary work, and still my software of choice for that. Using it with the ASI1600 was otherwise seamless. APT seems nicely integrated and works well with the camera. The particulars related to the camera can be seen in the Status block. 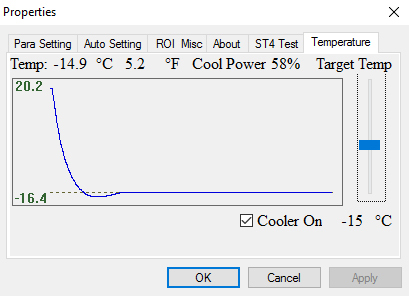 It shows the cooler is on AC power and working at 16% and was set to -20C (though showing -19.8C here). I was capturing 20” exposures on the Iris Nebula. It is integrated well with PHD2 also and supports dithering and will discard frames with bad tracking. The exposure controls work well. I did not get into too much detail on the framing and focusing tools, though it has them. I think the software is worth a look for those in the market. Since I am a paying SGP customer, I was just test driving APT and will go back to my normal routine. But, my first pass at APT showed it is very capable and, in my opinion, a value for the full version. For anyone not knowing, the gain setting is very configurable on this camera. Gain is equivalent to setting the ISO on a digital camera. ZWO has established 3 setpoints in the ASCOM driver to assist the user. These are “Highest Dynamic Range”, “Unity”, and “Lowest Read Noise”. Unity gain is the point where one electron e- is converted to one ADU (analog to digital unit). There are many available articles (and opinions!) on this so I won’t go into detail about what it means to operation of the camera. This will be a common selection for people with this camera simply due to the fact that it offers low read noise with a still generous dynamic range. If you haven’t seen them from this camera yet, you are living under a rock! But, for completeness of the review I have some to share. When starting out with this camera, I intended to really try and see what the low noise brings to the table. To that end I imaged targets with much shorter exposures than I typically do. For my initial round of testing I chose 20 second exposures at unity gain setting. 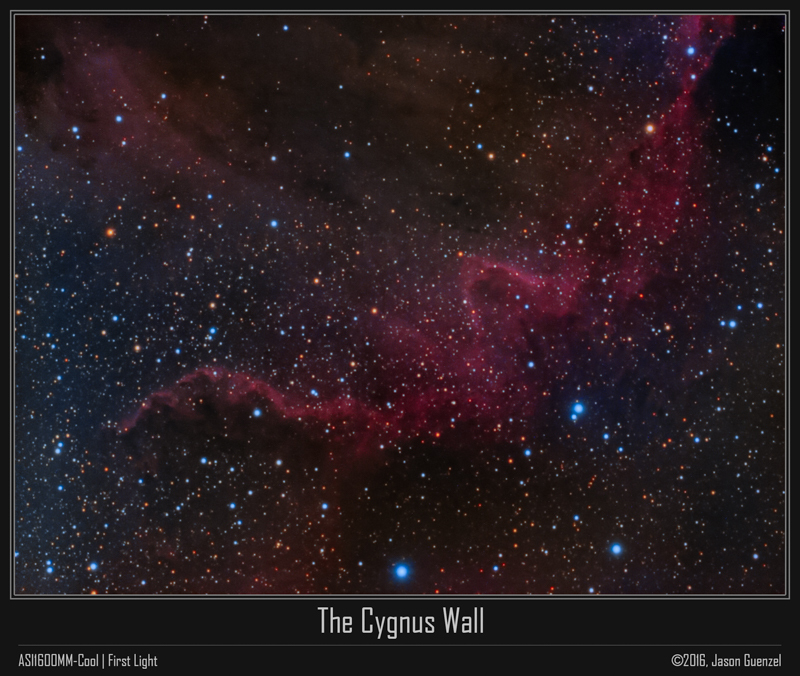 This images are presented downsized to 800px wide for the review and with PixInsight’s Screen Transfer Function (STF) applied. Rest assured, this type of scrutiny uncovers gradients that are absolutely miniscule but could potentially be uncovered with intensive histogram stretching. The big question on everyone’s mind is if the frames calibrate 100% of the amp glow away reliably and repeatedly. In my testing so far it has been **mostly** the case that I haven’t had an issue. Did have instances where I observed some issues, but I cannot rule out operator error and still working on what I think the problem was (not the camera). This flat is using a manual filter wheel with the 1.25” luminance filter as close as possible to the camera. 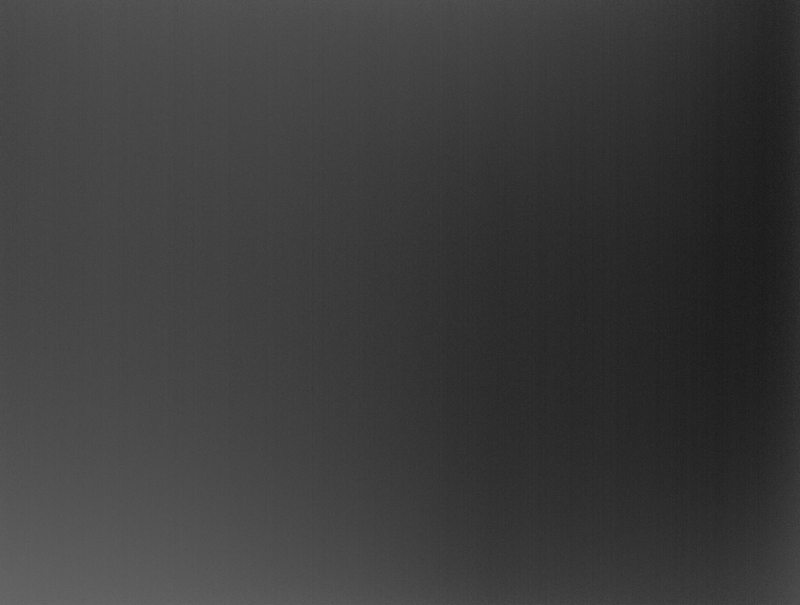 It literally is less than .5mm from the front of the camera. I know this due to an unfortunate rubbing sound before I shimmed it forward .5mm. It is obvious that the extreme corners are vignetted from the filter. But, it seemed to calibrate OK.
Edited by Thirteen, 22 May 2016 - 11:11 PM. Just to make sure everything was operable in the absence of SGP when I tested it, I launched Firecapture. For giggles, I pushed the gain up to the low read noise setting. 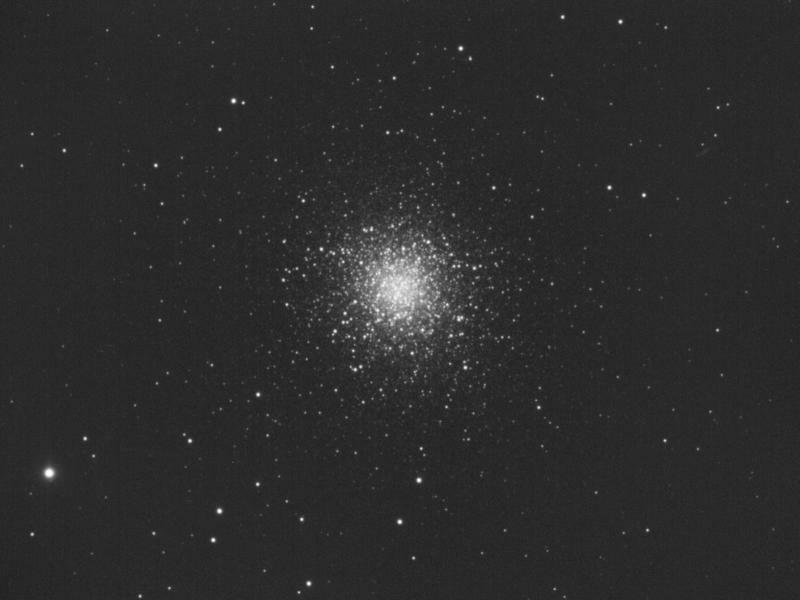 Here is M13 with a luminance filter, 1000 x 2s at 300 gain. The sequence was captured as an SER format (uncompressed) video. 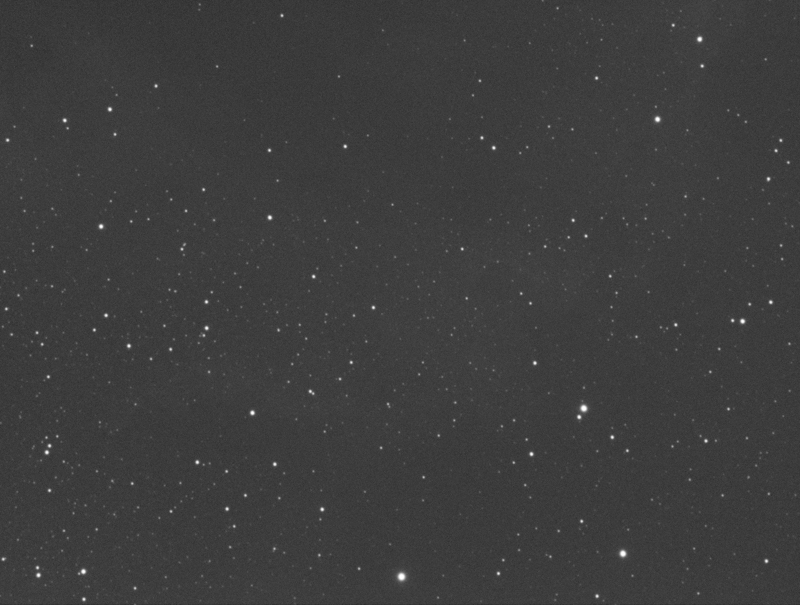 I stacked in AutoStakkert!2 with a few star align points and we get an image! This is an uncalibrated stack of just light frames. It was processed only with gradient removal and STF. There are some faint vertical bands apparent which is probably bias, due to that not being subtracted. I feel this is a pretty decent start with the camera. Hopefully the jpg monster doesn't eat this one up. I had to downsize to post here because the original 16mp resolution. Edited by Thirteen, 22 May 2016 - 11:18 PM. Congrats Jason. You should really enjoy the extra real estate. 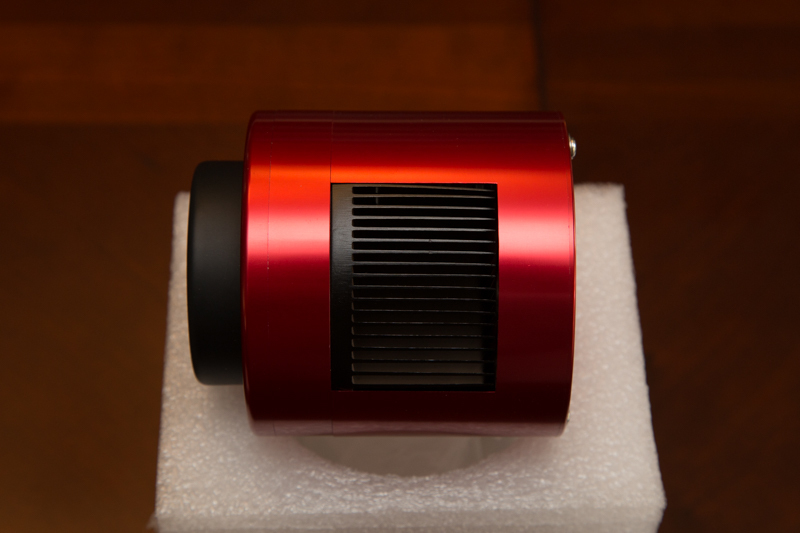 I have been thinking about the MC cooled version in place of my Canon 6D. Edited by syscore, 22 May 2016 - 11:24 PM. Looking promising Jason and excellent write up! I appreciate your approach to the review and think that taken in the light you are talking about it, it is absolutely an excellent value and a very nice step up into affordable monochrome imaging. Can't wait to start seeing some amazing images coming from you guys with this. I chose a target with a pretty decent range of features as a first test. I generally prefer galaxies to nebulae, simply because I shoot at a long focal length. But NGC7000 was something I had wanted to shoot this year and it offered nice positioning to steer clear of the moon while I captured. 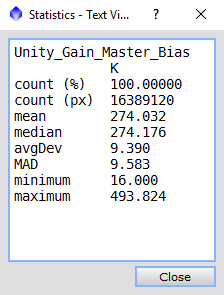 As I said earlier, I used 20s subs at unity gain for this test. ....and....I'm pretty happy for less than 90 minutes of integration of 20 second subs. Edited by Thirteen, 23 May 2016 - 12:10 AM.